Diabetes is a health condition that will present a number of different symptoms in your pet Chihuahua. Diabetes most often occurs in aged dogs, though it is not unheard of for young Chihuahuas to develop the condition as well. Your Chihuahua may be genetically predisposed to diabetes, as the condition is hereditary, and adults can pass it to their offspring. 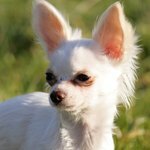 It is important to be able to identify Chihuahua diabetes symptoms to identify the illness early in its development so that proper treatment can take place. Excessive water consumption is one of the first signs that there may be something wrong with your Chihuahua. You should always try to monitor how much water your pet drinks on a regular basis so that it is easier to determine if it is drinking more water than usual. You should take into consideration that your dog is likely to drink more water naturally during periods of hot weather or after periods of exercise and play. However, if the excessive water consumption is consistent, you should contact your veterinarian. Dogs with diabetes will often urinate more often than dogs not suffering from the disease. Excessive urination in dogs with diabetes is not always the result of frequent water consumption, so you should not rule out a problem if you notice your dog urinating more after drinking too much water. Dogs with diabetes mellitus may urinate more frequently without drinking excess amounts of water. If you notice your dog urinating more often than usual or it begins to have "accidents" more frequently, it may be an indication that there is a health problem that your vet needs to investigate. Diabetes causes a deficiency of naturally occurring insulin in the body. Without insulin, the dog's brain lacks essential sugars it needs to function properly. This sugar deficiency stimulates the brain to believe it is hungry, causing the dog to want to eat continuously. Though the dog is eating more, the body will not properly digest nutrients from the food, resulting in a steady decline of weight. Dogs that are suffering from canine diabetes mellitus often develop cataracts, which are caused by excess levels of water in the lens of the eye. The presence of a canine cataract causes a small opaque white area in the lens of the eye that, if left untreated, may affect the entire structure of the eye. Chihuahuas that develop canine cataracts as a result of diabetes will have to have both conditions treated separately, as treatment of the diabetes will not stop the spread of the cataract.